Two asteroids graze in the asteroid belt, initiating oribital changes that could eventually lead a frament to Earth. Oil on sealed 140lb watercolor paper, 10.5 x 20.125 inches, 1999. From the children's book Asteroid Impact, pub. by Dial in 2000. The asteroid that will end the Cretaceous drifts past the moon's southern pole, above a large crater, similar to the one the asteroid will leave on Earth. Falling toward a point to be shared by Earth in the hours ahead, the planet's gravity will add 1,000's of mph to the asteroid's velocity. 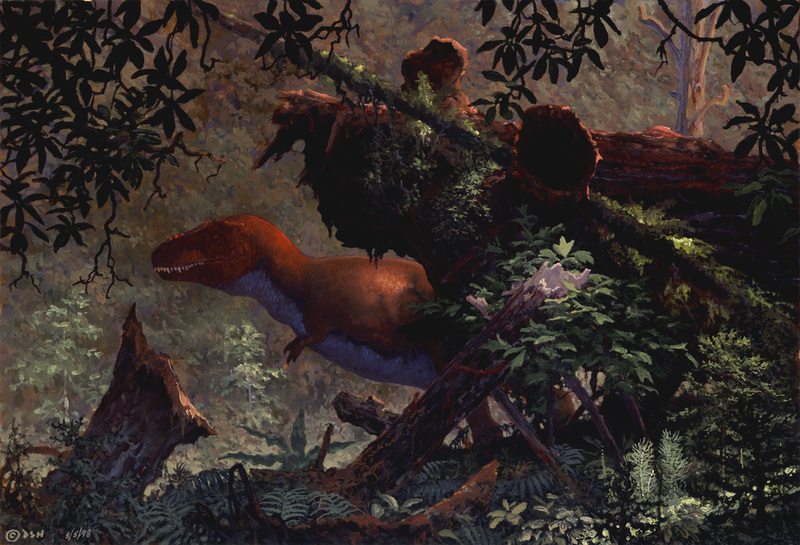 A Tyrannosaur in a late Cretaceous flora of Montana, some 67 million years ago. Oil on sealed 140lb watercolor paper, 12.125 x 18 inches, 1998. From the children's book Asteroid Impact, 2000. 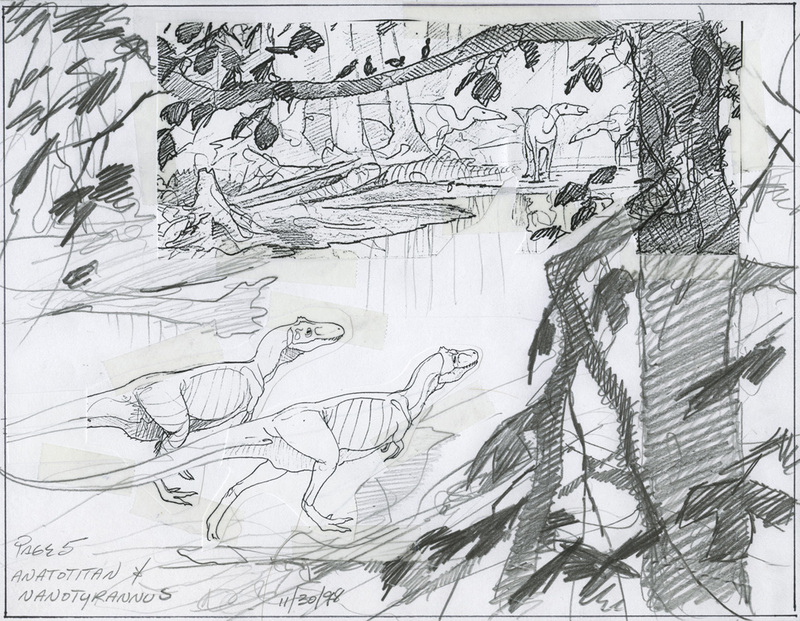 Preliminary drawing of Pterosaurs and Plesiosaur in the late Cretaceous inland sea of Arkansas some 67 million years ago. Pencil and Prisma on bond paper, 1998. 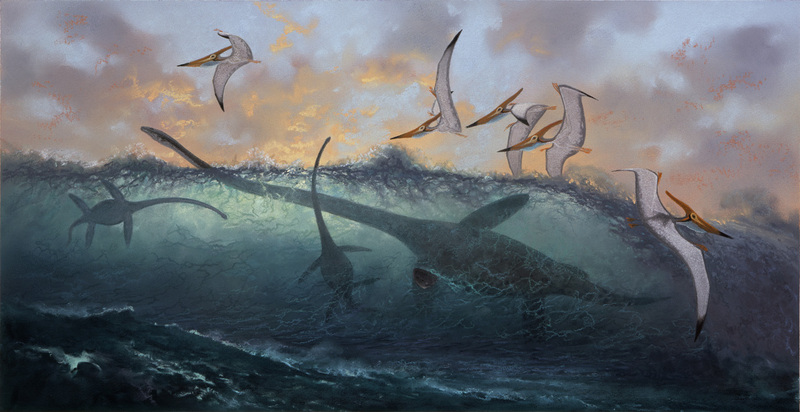 Several Elasmosaurs (long-necked plesiosaurs, marine reptiles) ride within a cresting wave on the inland sea near the coast of Cretaceous Arkansas some 67 million years ago. 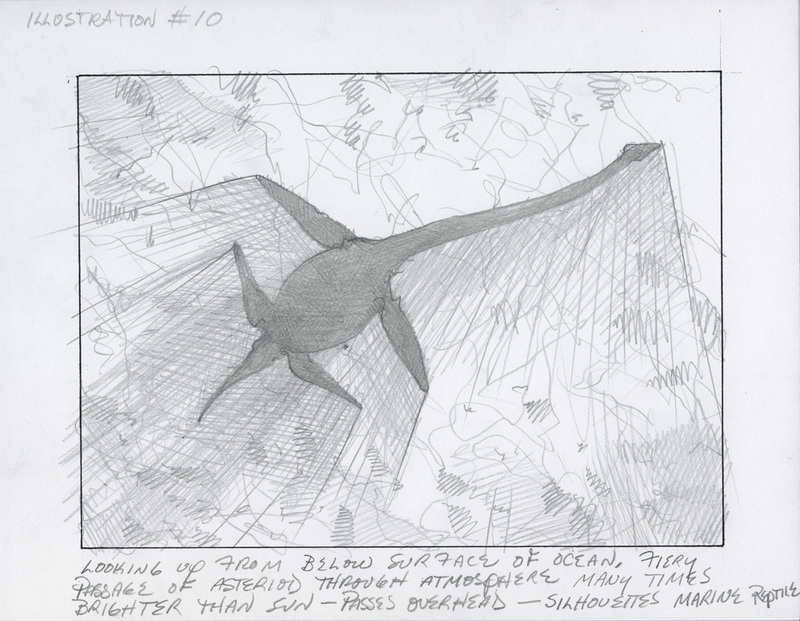 Pteranodons skim the waves, lifted by currents of displaced air in a search for fish. Pastel on 140 lb watercolor paper, 11.75 x 23 inches, 1999. From the children's book Asteroid Impact, 2000. 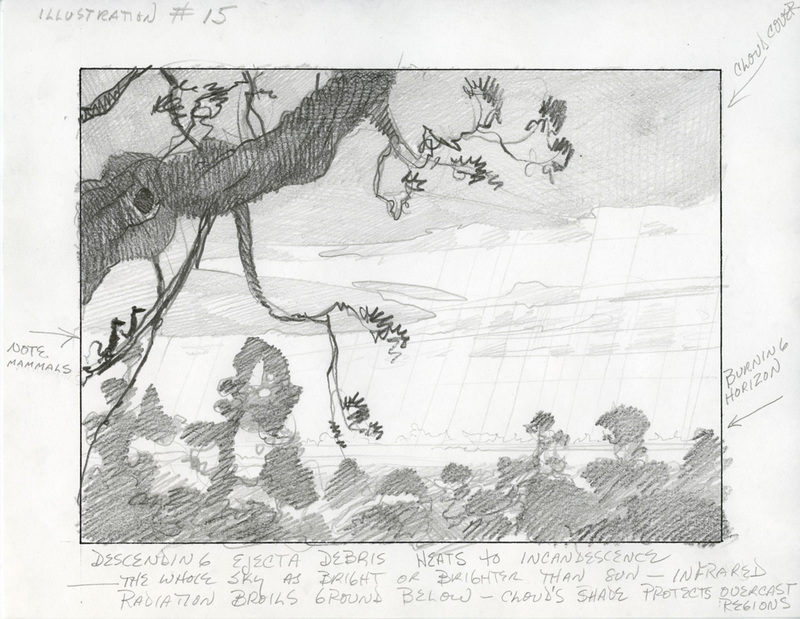 Preliminary drawing of birds on a branch singing sweetly above a troupe of Anatotitans in sub-tropical Alberta, Canada. Pencil on bond paper, 1998. 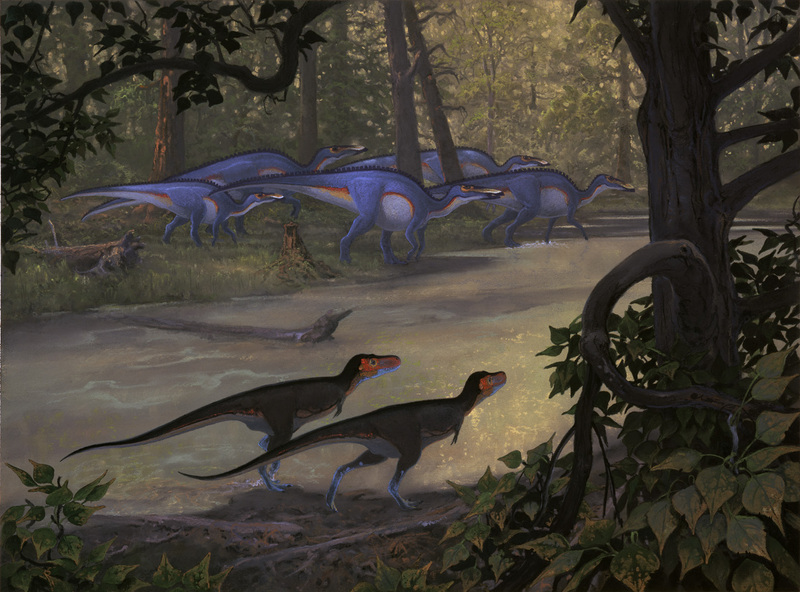 Preliminary outline of Nanotryannus stalking Anatotitan. Photocopy with pencil and collage on bond paper, 1998. 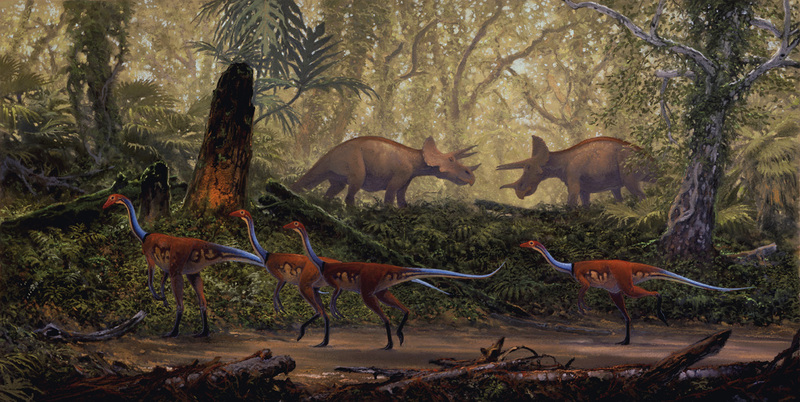 A pair of Nanotyrannus, late Cretaceous, medium-sized theropods, approach a group of Anatotitan, large duckbill dinosaurs. The landscape represents the more temperate forests of Canada some 67 million years ago, including conifers and cottonwood-like hardwood trees. Pastel on 140lb watercolor paper, 15.5 x 21.125 inches, 1999. From the children's book Asteroid Impact, 2000. 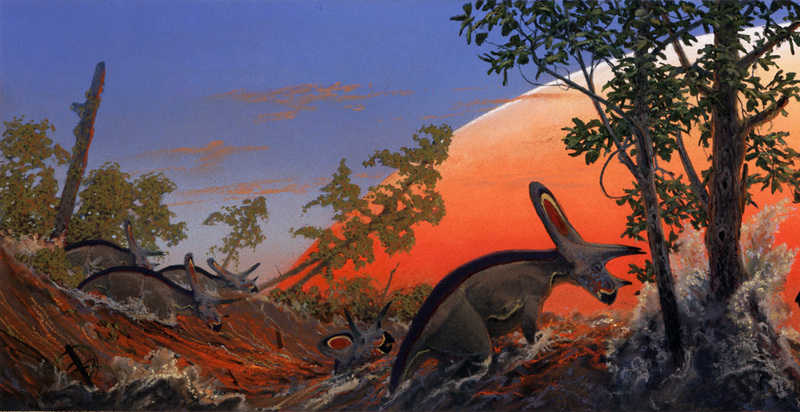 Two Triceratops spare beyond a group of Struthiomimus in a late Cretaceous Montana landscape some 67 million years ago. Pastel on 140lb, 12.25 x 24.125 inches, 1999. From the children's book Asteroid Impact, 2000. 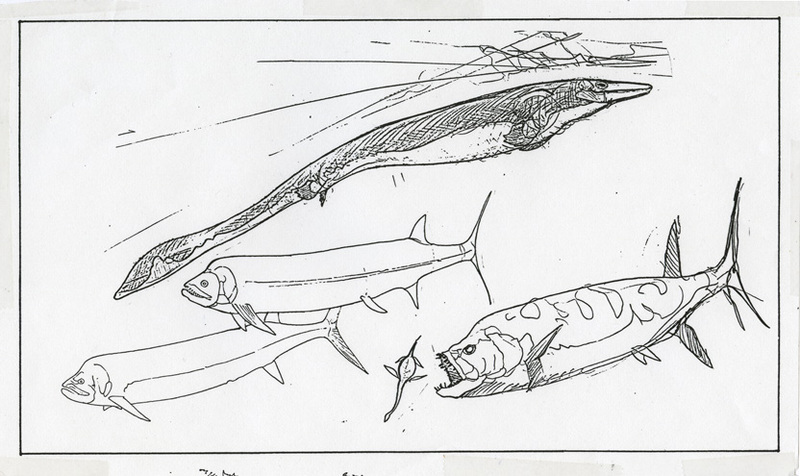 Preliminary outline of Mosasaur and Xiphactinus illustration. 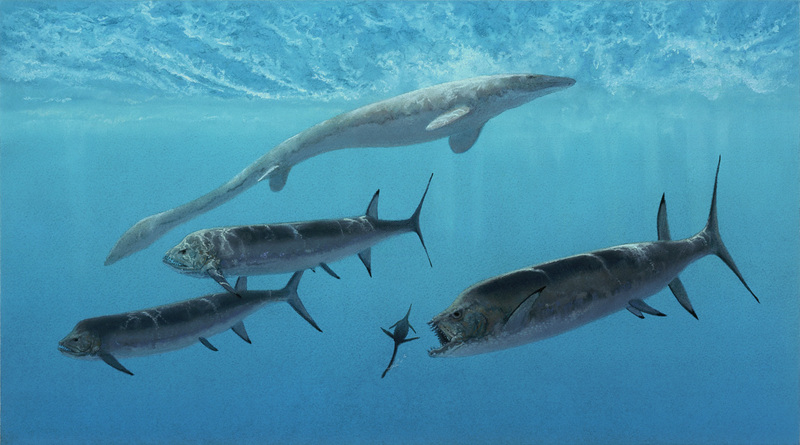 Three Xiphactinus, large predatory fish, pass near a mosasaur, a marine reptile, in the late Cretaceous inland sea that connected the Arctic Ocean with the Gulf of Mexico through central North America 80 million years ago. Pastel on 140lb watercolor paper, 12.125 x 22 inches, 1999. From the children's book Asteoid Imapct, 2000. 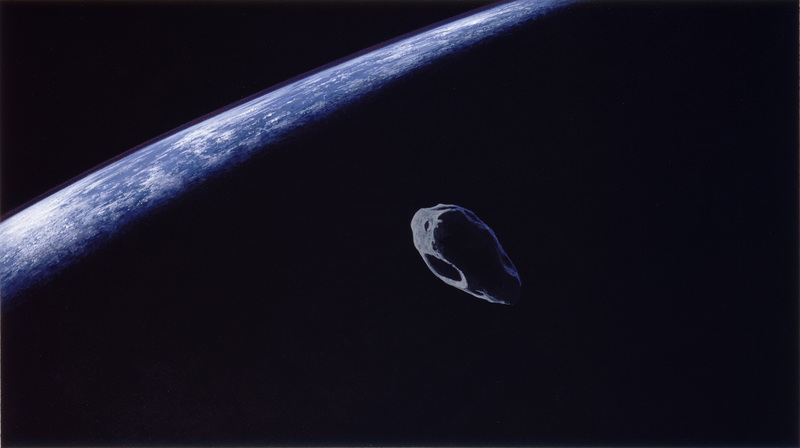 A 6 to 10 mile wide asteroid approaches Earth, about to vanish into the planet's shadow, moments before reaching the atmosphere. Acrylic on 140lb watercolor paper, 11.25 x 20.125 inches, 1999. From the children's book Asteroid Impact, 2000. 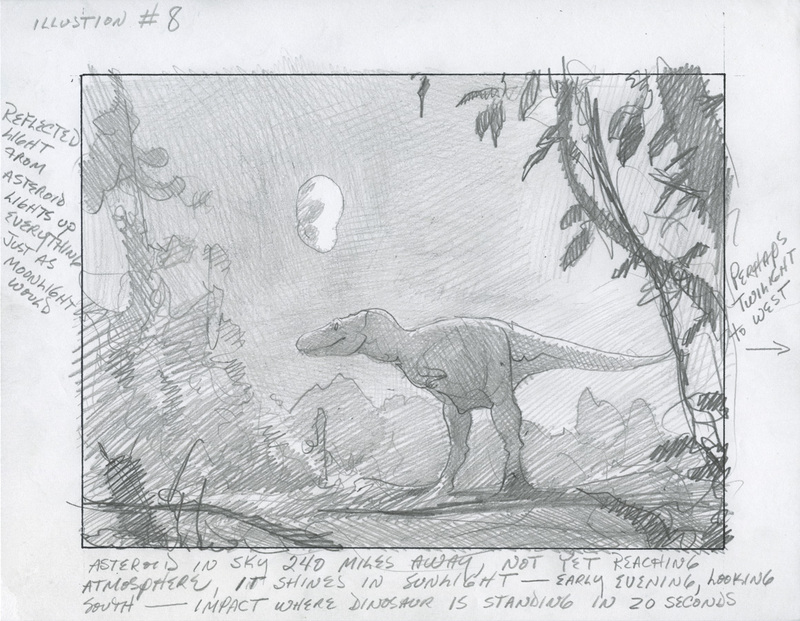 Preliminary drawing of T-rex and an approaching asteroid visible in the sky, one from a set of a few dozen sketches used to represent the book proposal, captioned with explanations. 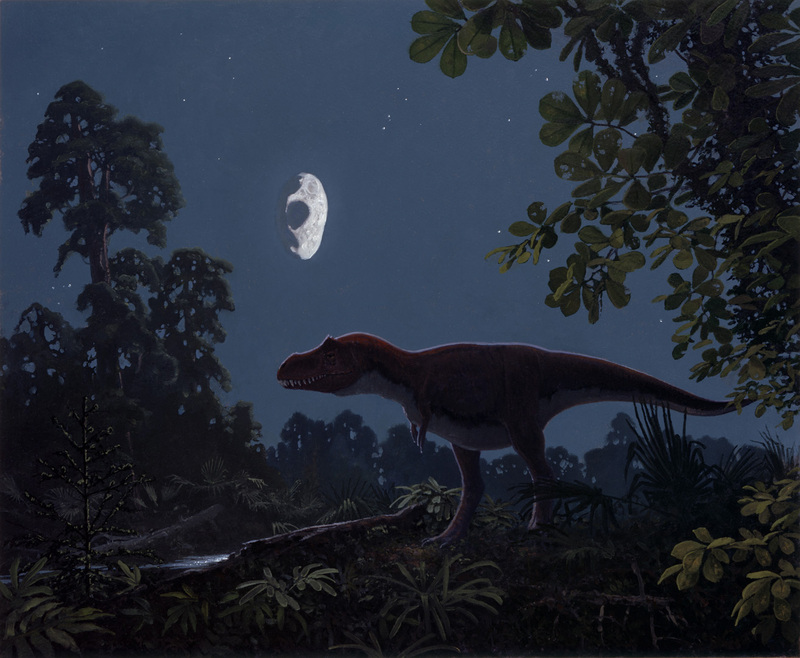 A lone Tyrannosaurus rex in southern North America stands poised in the reflected light of an approaching asteroid, now but a few seconds from reaching Earth's atmosphere. 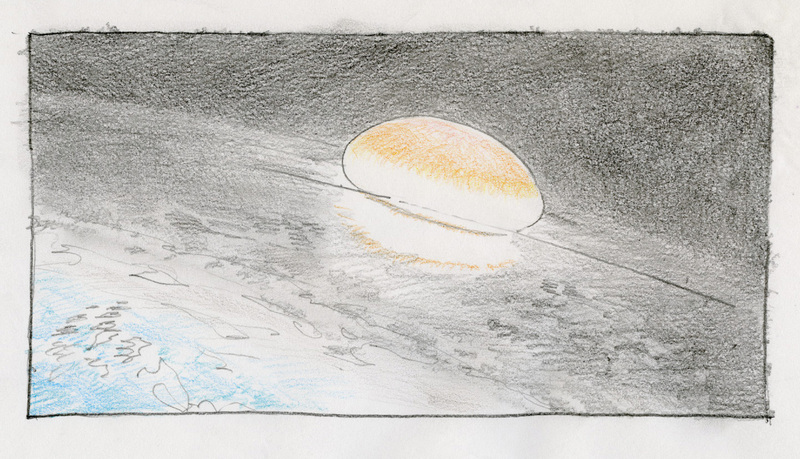 Preliminary drawing of asteroid entering Earth's atmosphere at a shallow angle. 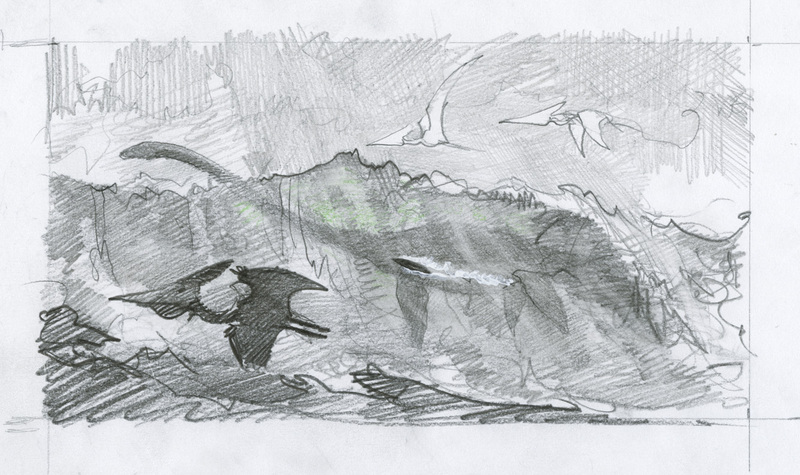 Preliminary drawing of plesiosaur silhouette against the bright passage of the asteroid above. 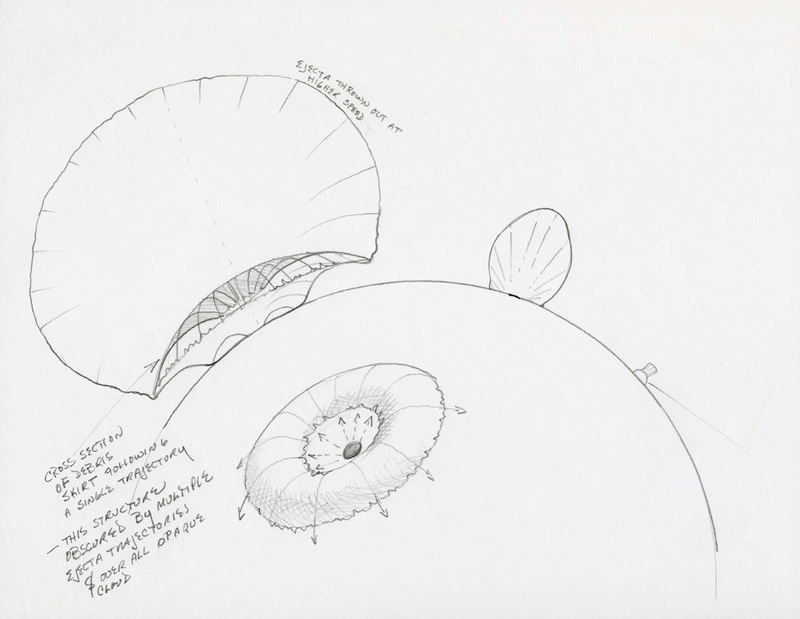 Preliminary sketch of asteroid entering atmosphere with leaping Tylosaur. Drawn on the back of an insurance form envelope. Ballpoint pen on paper, 1999. 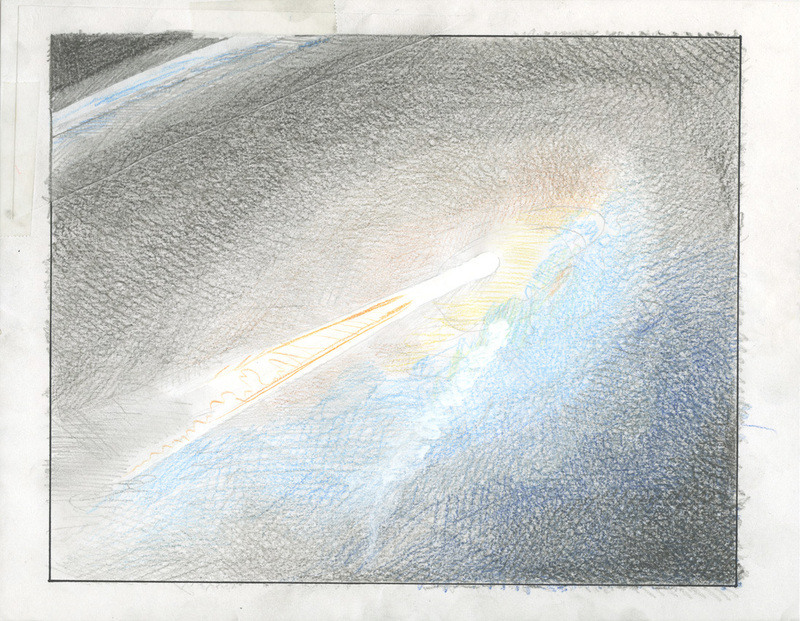 A 6+ mile wide asteroid plunges down through the atmosphere as a Tylosaur (marine reptile) leaps in the near distance. Pastel on 140lb watercolor paper, 17.875 x 26, 1999. From the children's book Asteroid Impact, 2000. Traveling at 60,000 mph, the 6+ mile wide asteroid passes below Earth's surface in a fraction of a second, producing compression waves that radiates both outward from the impact site and back up through the asteroid with sufficient energy to heat and vaporize rock and ocean into a cloud of super hot, rapidly expanding gas. Oil on sealed 140lb watercolor paper, detail from 16.25 x 20.25 original, 1999. From the children's book Asteroid Impact, 2000. 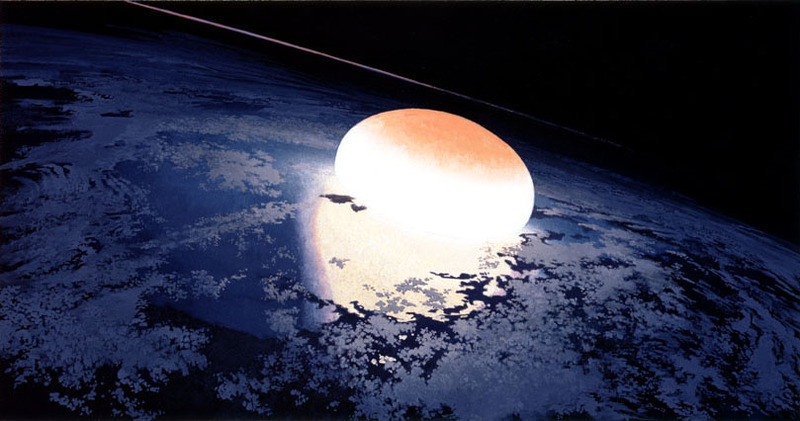 A vapor plume, a bubble of vaporized sea, land and asteroid, rises above the horizon, viewed from afar across illuminated ocean clouds. Oil on sealed 140lb watercolor paper, 12.625 x 20.25 inches, 1999. From the children's book Asteroid Impact, 2000. 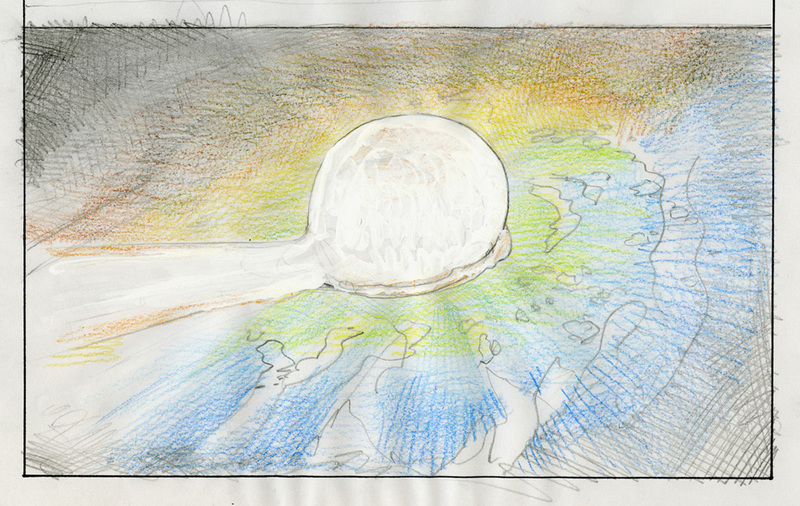 Preliminary drawing of hemispheric vapor plume rising from a growing crater. Prisma and white ink on bond papaer, 1998. 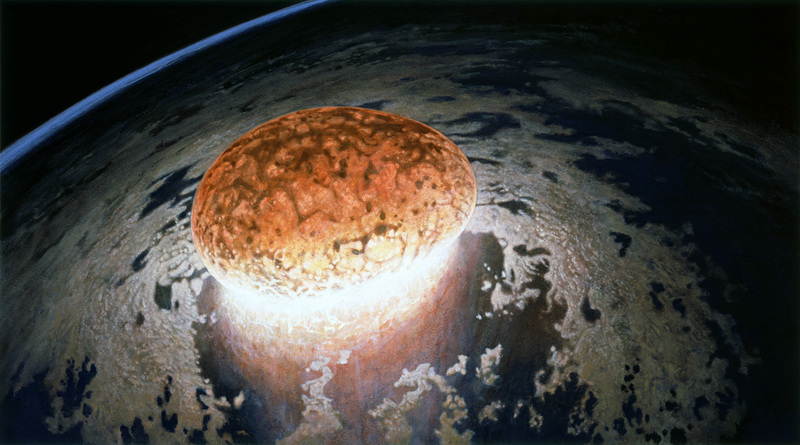 A hemispheric vapor plume, a bubble of hot gas with internal pressure several million times atmosphere, expands outward on the night side of Earth at speeds equal to or in excess of the asteroid's impact velocity. Both ocean and atmosphere are pushed aside, squeezed and heated to incandescence. 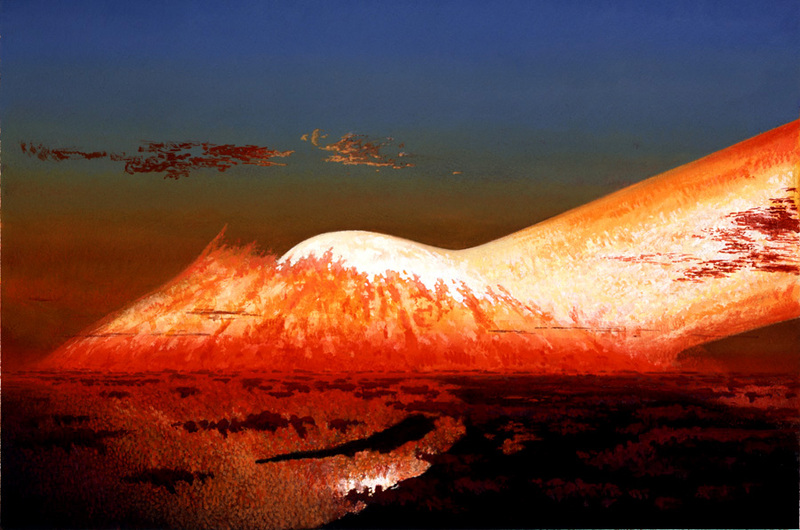 A hypersonic compression wave excavates a crater, the rock vaporized, briefly maintaining the plume's high internal pressures. Oil on sealed 140lb watercolor paper, 11.375 x 20.125 inches, 1999. From the children's book Asteroid Impact. 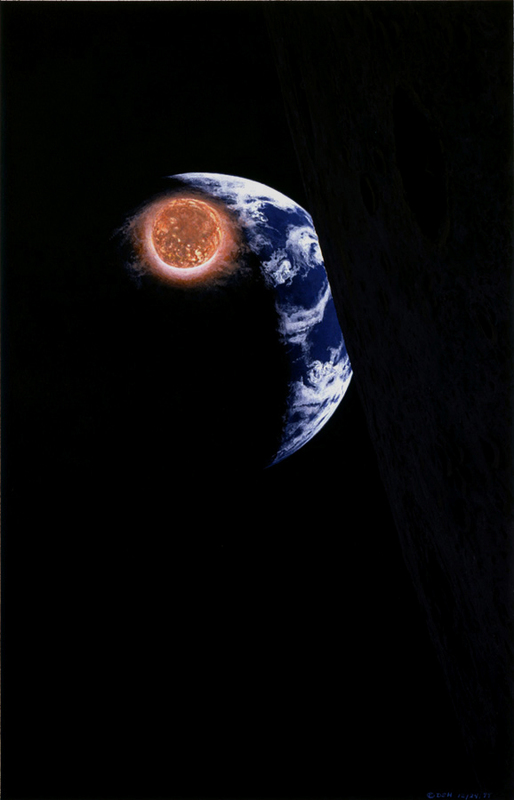 A brilliant light on Earth's night side as seen from near the Moon. Within seconds, the ground compression wave begins to lag behind the vapor front and with its energy infused into greater volumes of rock, crater ejecta transform from vapor to molten particles. 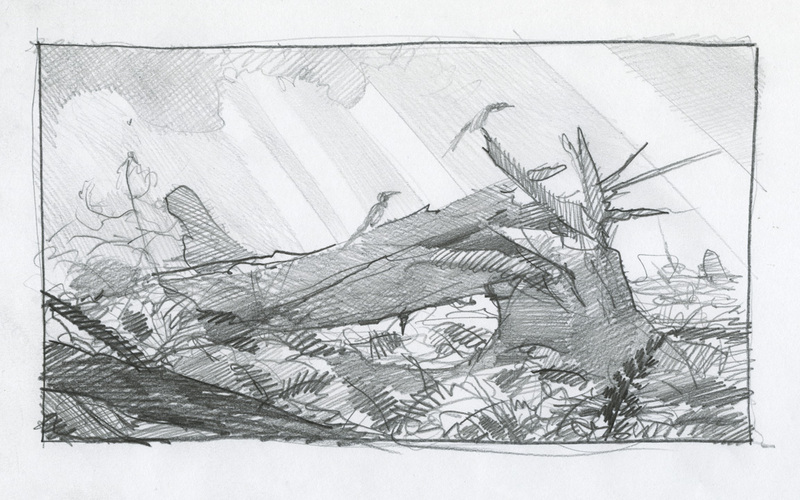 Pencil on bond paper, digitally toned, 1998-2013. 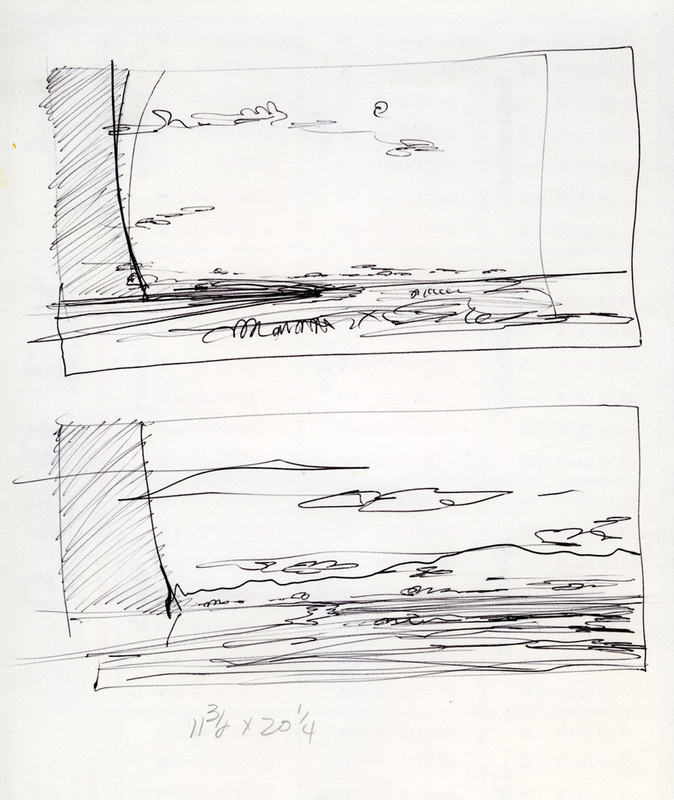 Preliminary drawings of vapor front. Ballpoint pen on back of a 1999 calendar front page. Radiant energy from the plume baths the Earth's surface with intense heat for a hundred miles ahead of the incandescent front. As the plume passes, it scours away the sea and land to bedrock. Oil on sealed 140lb watercolor paper, 11.375 x 20.25 inches, 1999. From the children's book Asteroid Impact, 2000. The vapor plume expands to 300 miles in diameter within 15 seconds, displacing the atmosphere as it rises above it. Crater ejecta transitions to rising skirts of dust and solid fragments, all concealed within the plume. Acrylic on 140lb watercolor paper, 9.625 x 22 inches, 1999. Preliminary drawing of vapor plume expanding on night side of Earth. The base of the plume is retarded by friction within the atmosphere, as the remainder begins to expand out into the vacuum of space. 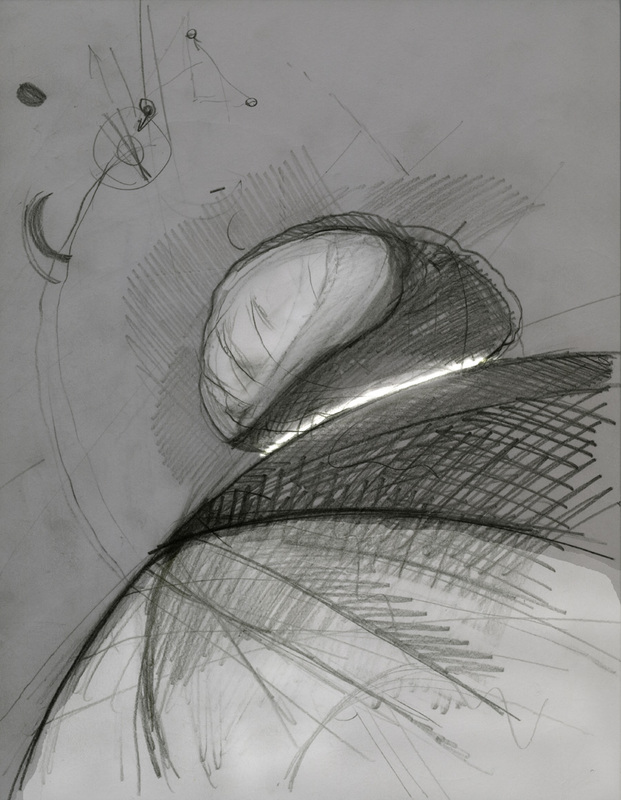 Pencil and Prism on bond paper, 1998. 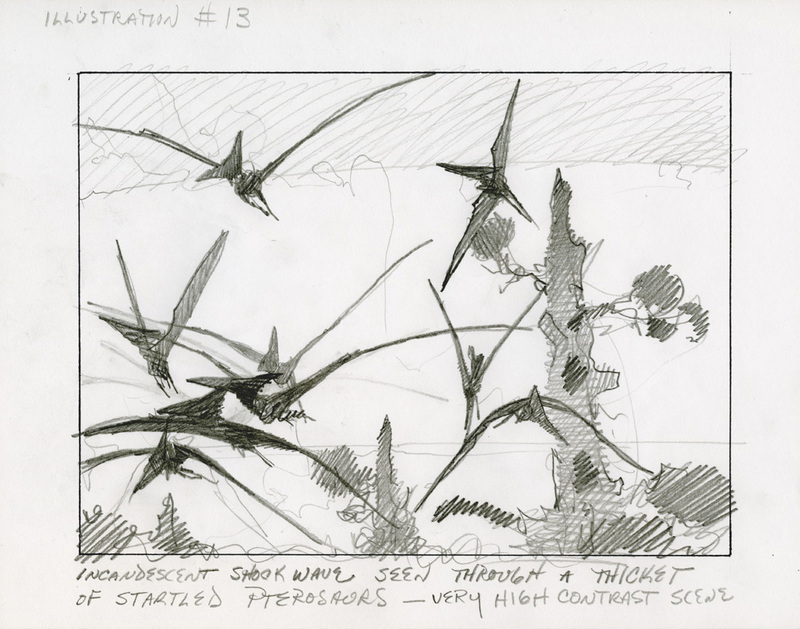 Preliminary drawing of pterosaurs startled by sudden intense light and heat. 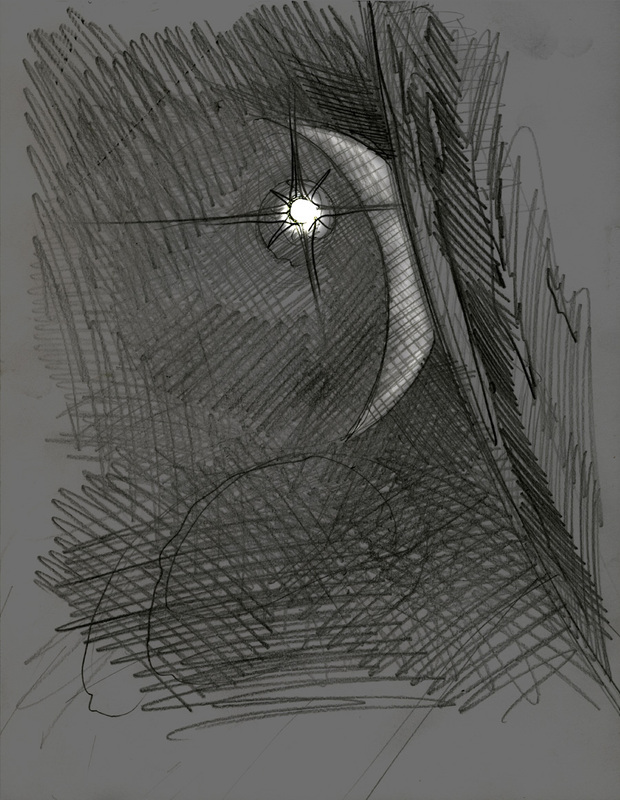 Preliminary drawing of distant incandescant plume approaching in silence and intense heat. 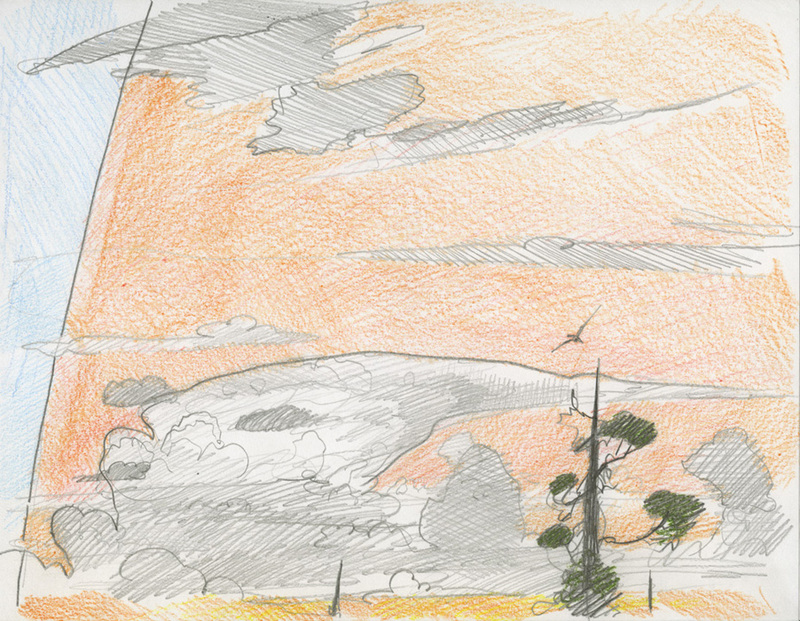 Preliminary drawing of the vaporplume growing above a distant horizon, dwarfing all means of scale. The vapor plume continues to expand within the atmosphere, but slowing due to friction, the displaced air still squeezed to incandescense. 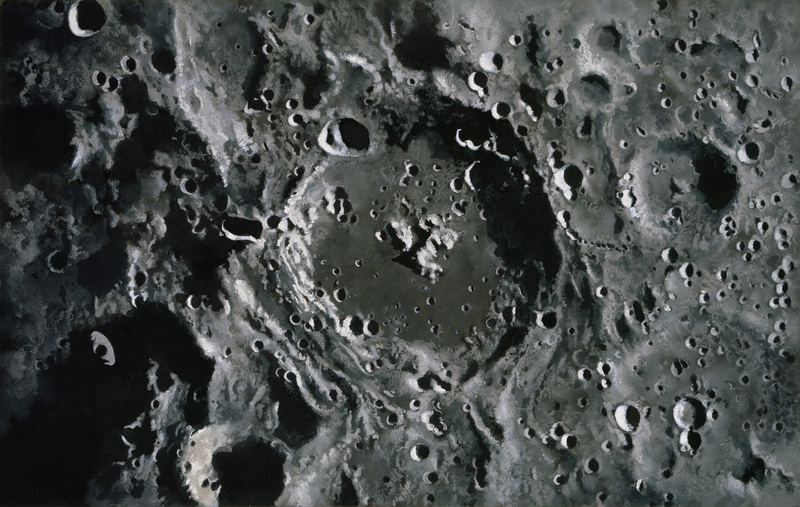 The ground compression wave has produced a crater some 50 miles in diameter and 25 miles deep, shoving the land around the crater outward and up into an elevated rim which immediately begins to fall and slump into the enormous, structurally weak hole. A wave of rebounding molten rock rises up from the crater's depths. Acrylic on 140lb paper, 12.125 x 22 inches, 1999. The base of the vapor plume grows to 600 miles in diameter within some fraction of a minute, before friction with the atmosphere brings it to a halt. The upper cloud spreads out above the atmosphere without constraint, its margins beginning to cool and condense back into fine dust. Acrylic on 140lb watercolor paper, 8.375 x 19, 1999. From the children's book Asteroid Impact, 2000. 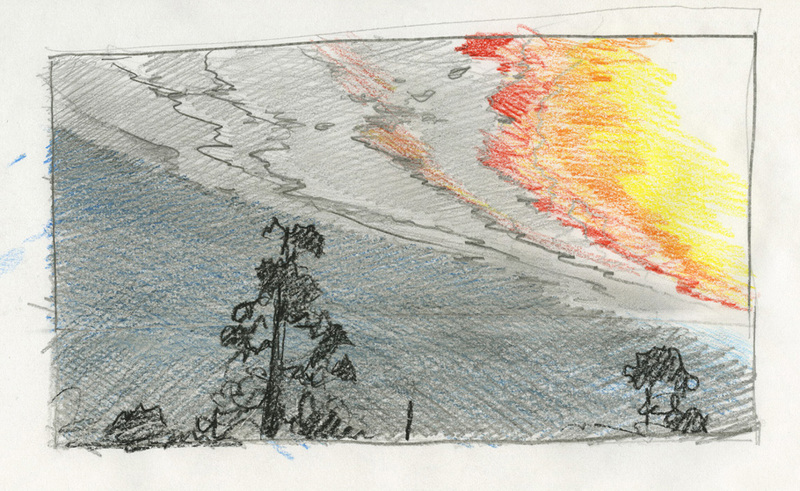 Preliminary drawing of plume rising above Earth's shadow into direct sunlight. The vapor plume expanding above Earth's shadow into sunlight as its outer margins of hot gas and vapor condense into opague clouds of dust and partcles of reflective ice. A portion of the ejected matter is blown upward at escape velocity, including a portion of the overlying atmosphere. Slower, lower arcs of ejecta are already falling back into the atmosphere, heating to incandescense and illuminatng the plume's base. Acrylic on 140lb watercolor paper, 13 x 20.125 inches, 1999. The growing plume, darkening as vapor condenses to thick dust and aerosols, as seen from a point near the moon. Much of the rising dust and ice will travel away from Earth for hours on trajectories that cover the globe. Material thrown upward returns far to the west of the crater, due to Earth's rotation. Acrylic on 140lb watercolor paper, 14.125 x 22 inches, 1999. 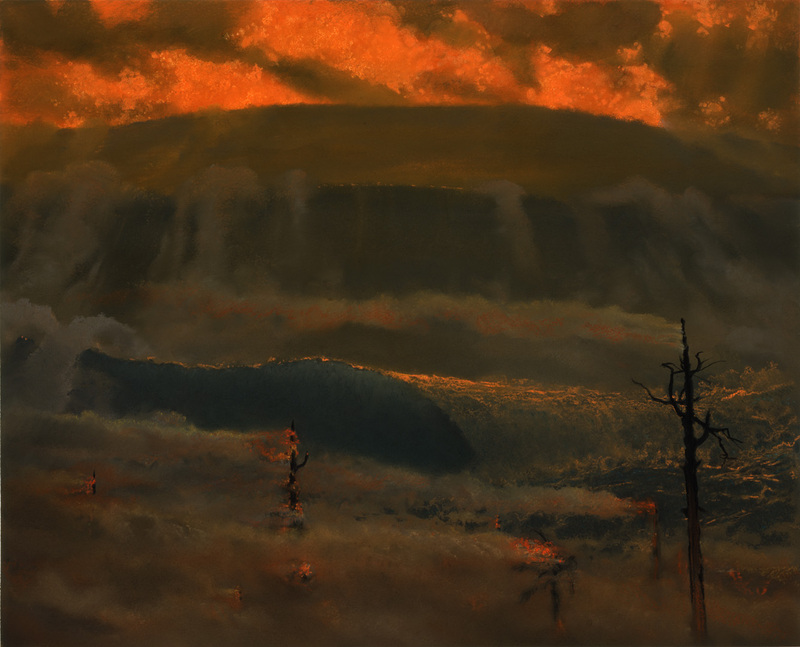 Preliminary drawing depicting vast walls of dust and larger debris thrown from the crater's rim by the ground compression wave falling back into the sea. Huge, chaotic waves defined by a recognizable object for scale. Walls of crater ejecta slump back into the sea, generating huge ocean waves. Pastel on 140lb watercolor papaer, 14.75 x 26 inches, 1999. From the children's book Asteroid Impact, pub. by Dial, 2000. A diagram of particle trajectories that shows a growing sphere of dust that descends to the Earth as it envelopes it. 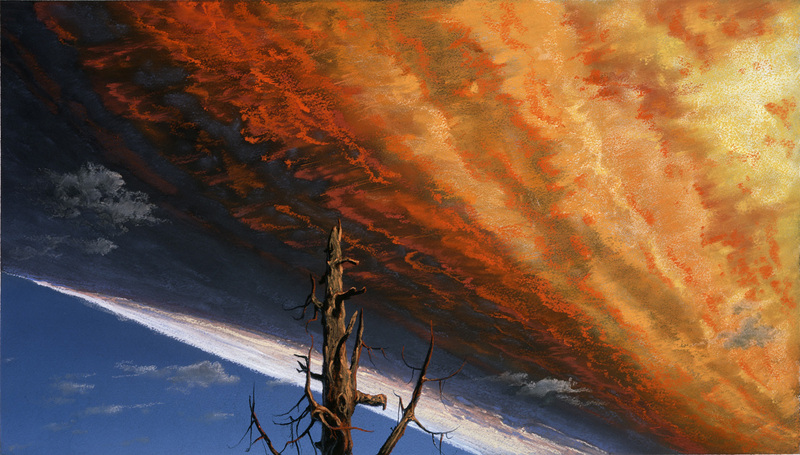 Preliminary drawing showing ejecta entering atmosphere. Dense clouds of ejecta on suborbital paths descend back into the atmosphere at night, growing to incandescence by friction with the air. Radiant heat baths the land below. A distant limb of the dust cloud catches sunlight as it travels beyond Earth's shadow. Pastel on 140lb watercolor paper, 13.5 x 24 inches, 1999. 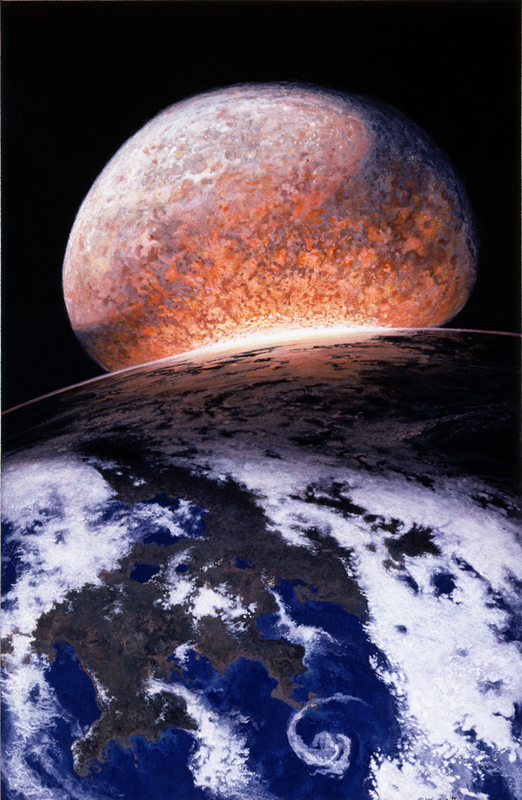 From the children's book Asteroid Impact, 2000. 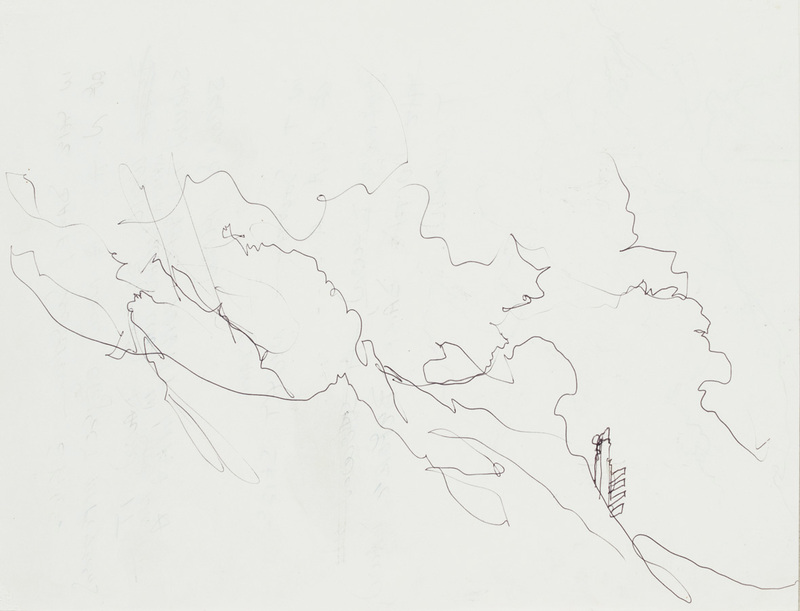 Preliminary drawing of earthquake events. 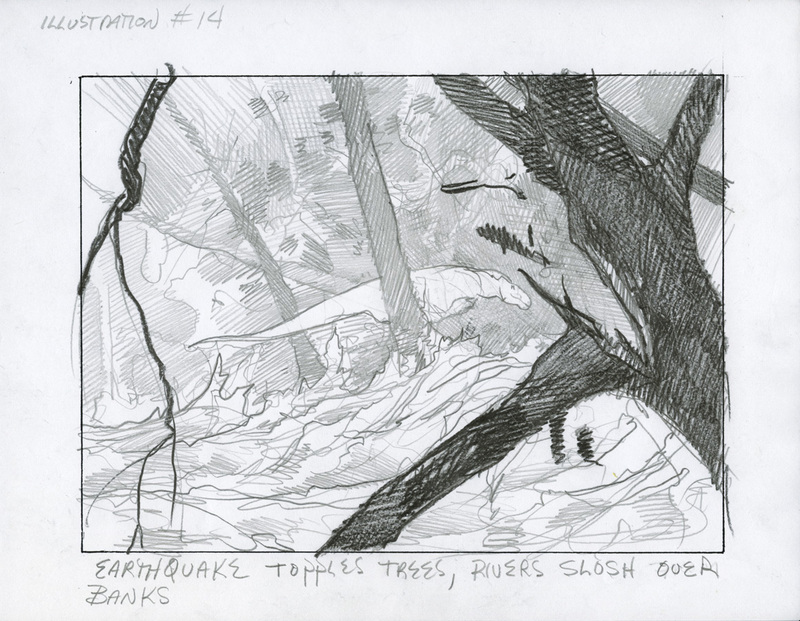 Preliminary design of earthquake illustration. Pencil and Prisma on bond papaer, 1998. 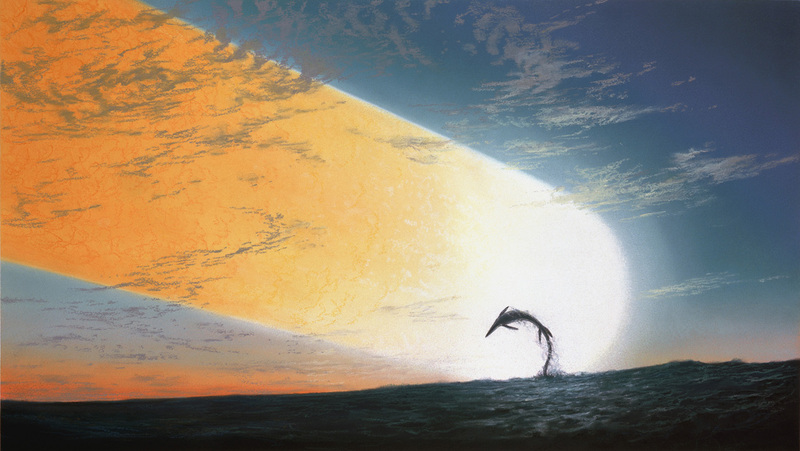 Torosaurs on a Texas coast caught in an earthquake caused by the passing ground compression wave, as the bright fireball climbs above the horizon. Actually, the ejecta launched on suborbital paths at high speed would have probably arrived overhead first. Pastel and ink on 140lb watercolor paper, detail from a 7.8 x 28.125 inches work, 1999. From the children's book Asteroid Impact, 2000. Preliminary drawing of overcast and radiant heat. 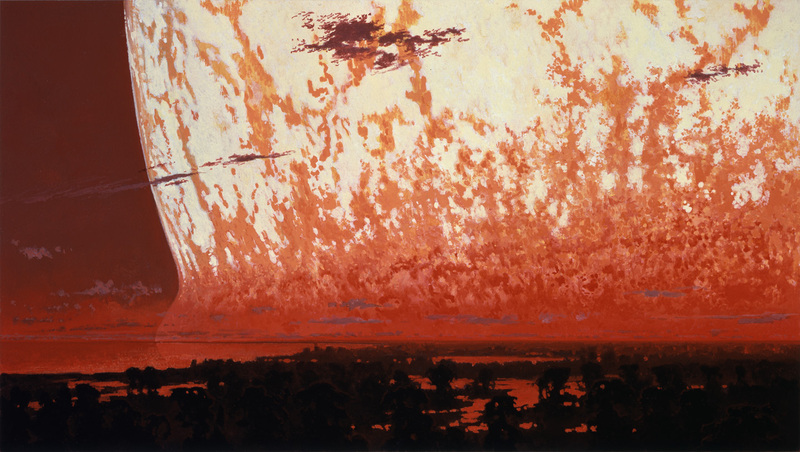 Preliminary drawing of extensive fires started by radiant heat from ejecta. 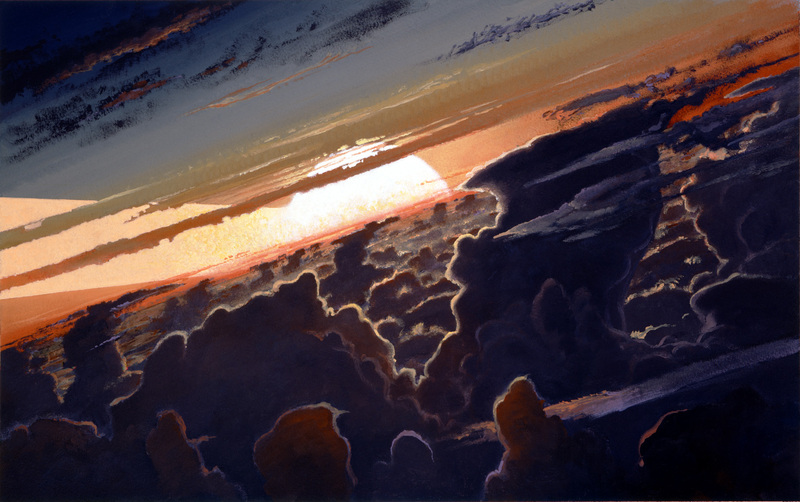 Vast fires and clouds of smoke and soot rise and drift under orange skies and the radiant heat of falling ejecta. Pastel on 140lb watercolor paper, 13.125 x 23 inches, 1999. From the children's book Asteroid Impact, 2000. 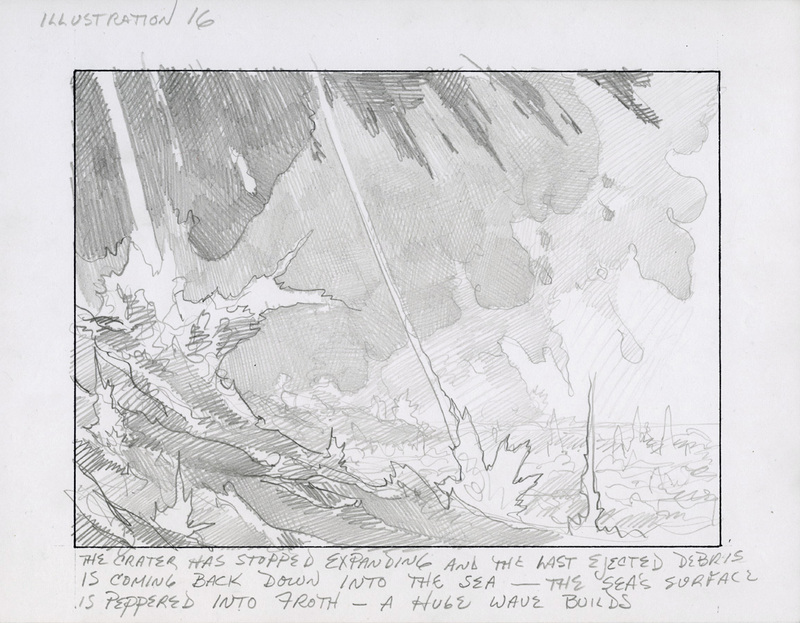 Prelminary drawing of the ocean pouring back into the hot impact crater. An idea proposed by Chuck Pillmore that went no further, for lack of space in a small book. 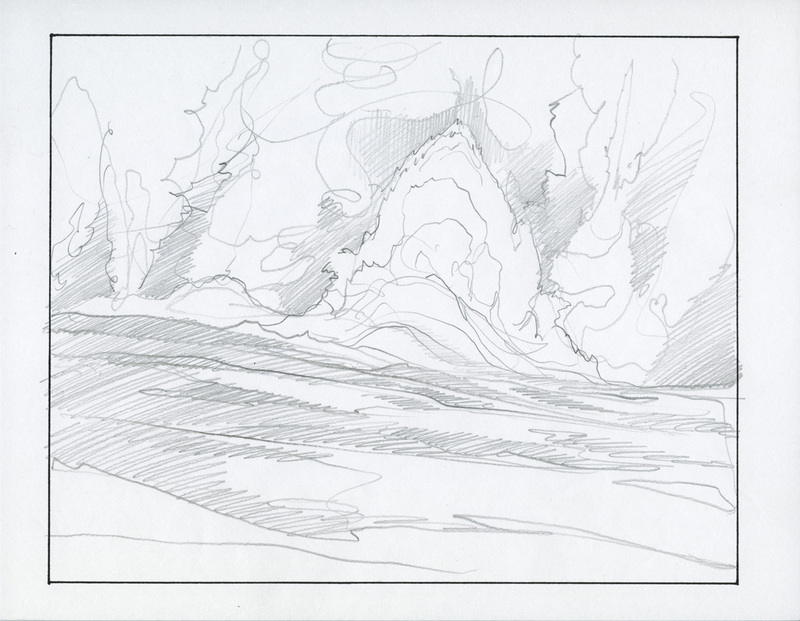 Preliminary drawing of huge waves spilling over a burning landcape. Pencil and color inks on bond paper, 1998. 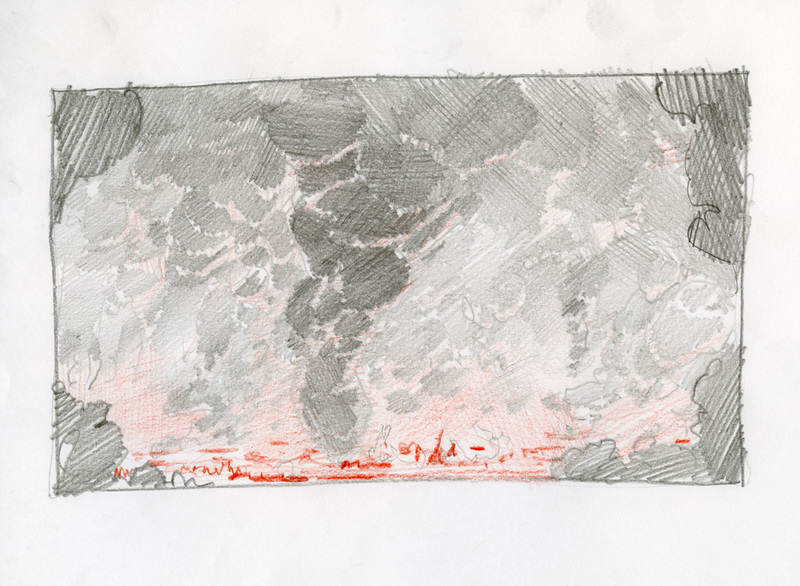 Preliminary sketch of huge waves and windswept fire. Pencil on bond paper, 1999. 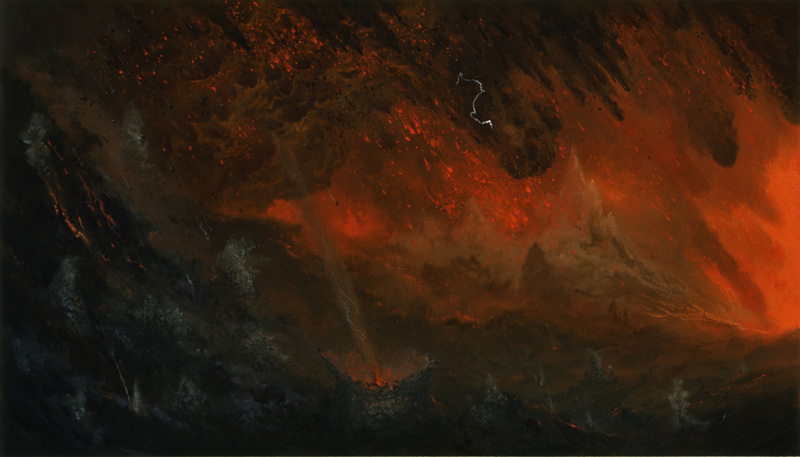 Tiers of huge waves build up as they approach the shallowing coast of Texas, seen through crowns of burning, windswept trees. 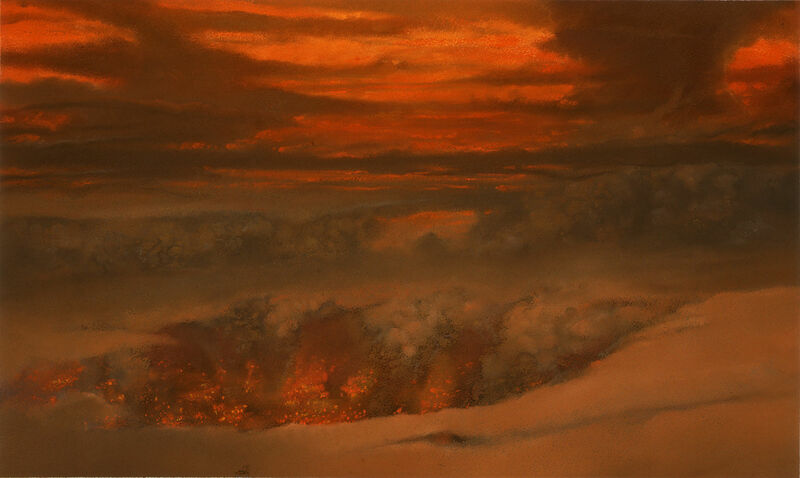 Pastel on 140lb watercolor paper, 17.75 x 22.125 inches, 1999. From the children's book Asteroid Impact, 2000. 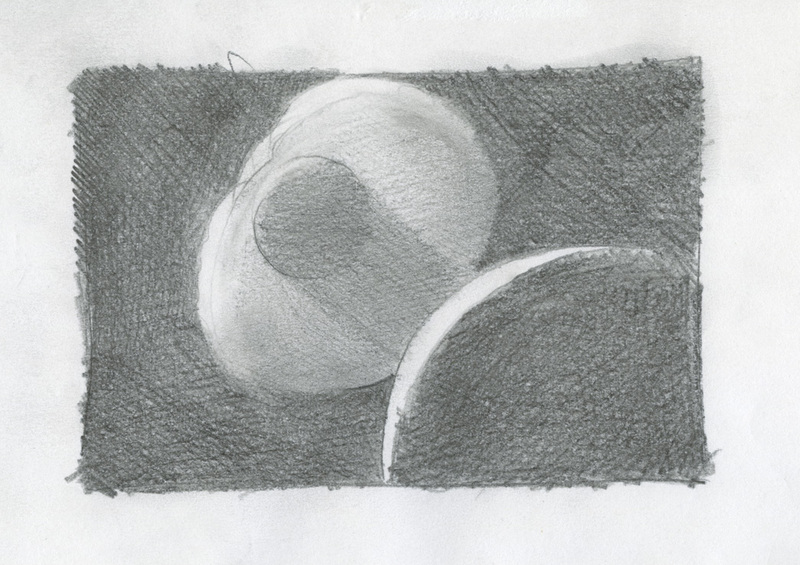 Preliminary drawing of Earth surrounded by descending clouds of dust and ice. 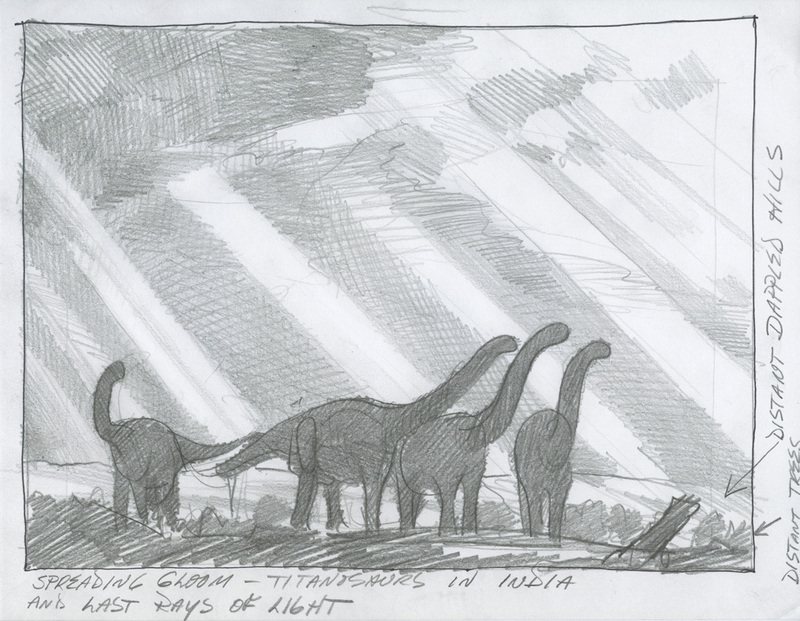 Preliminary drawing of Titanosaurs in India under dimming skies and last light. 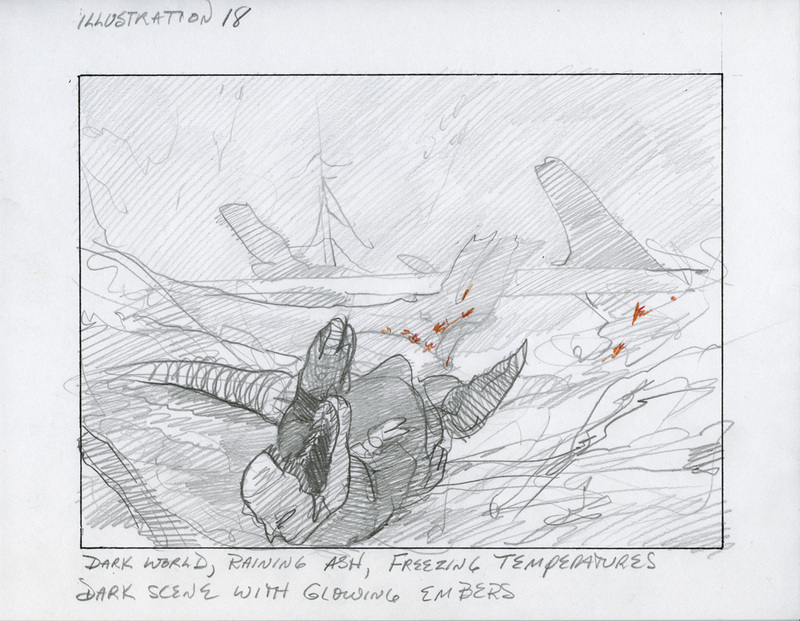 Preliminary drawing of dead T-rex in embers and cold. 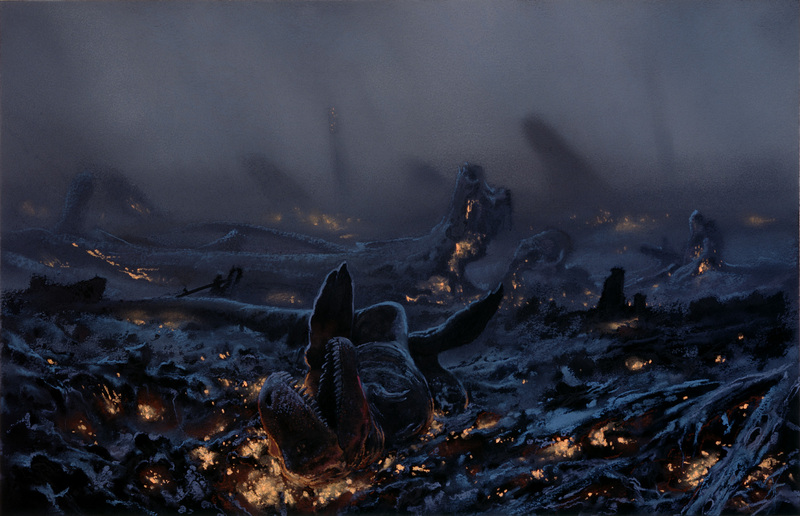 A dead Tyrannosaur lies among embers of a blasted forest in the cold, snow, ash, and dark gloom of an impact winter. Pastel on 140lb watercolor paper, 14.125 x 22 inches, 1999. From the children's book Asteroid Impact, 2000. 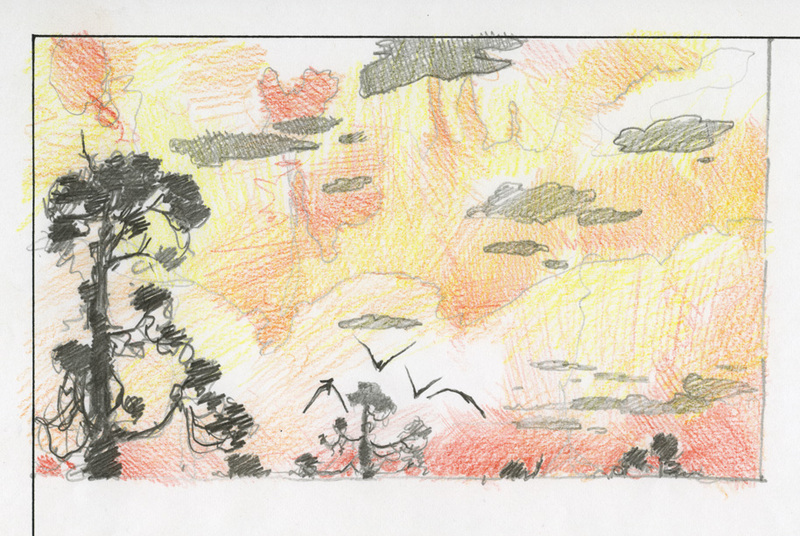 Preliminary drawing of birds greeting the return of light. A mammal surveys a ruined forest as clearing skies allow sunlight to return. Pastel on 140lb watercolor paper, 9 x 24 inches, 1999. 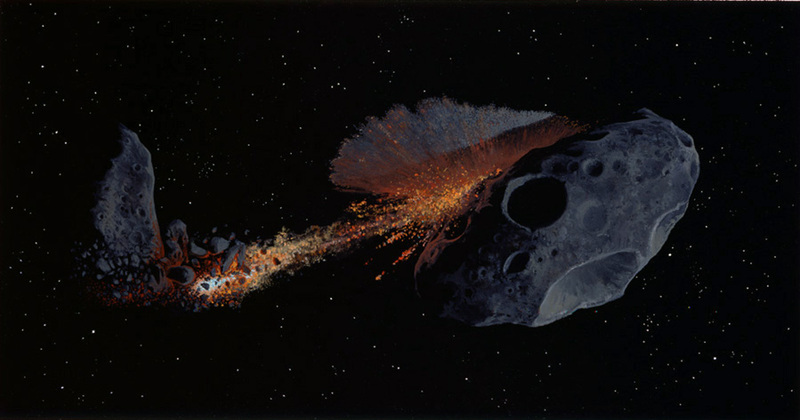 From the children's book Asteroid Impact, 2000. 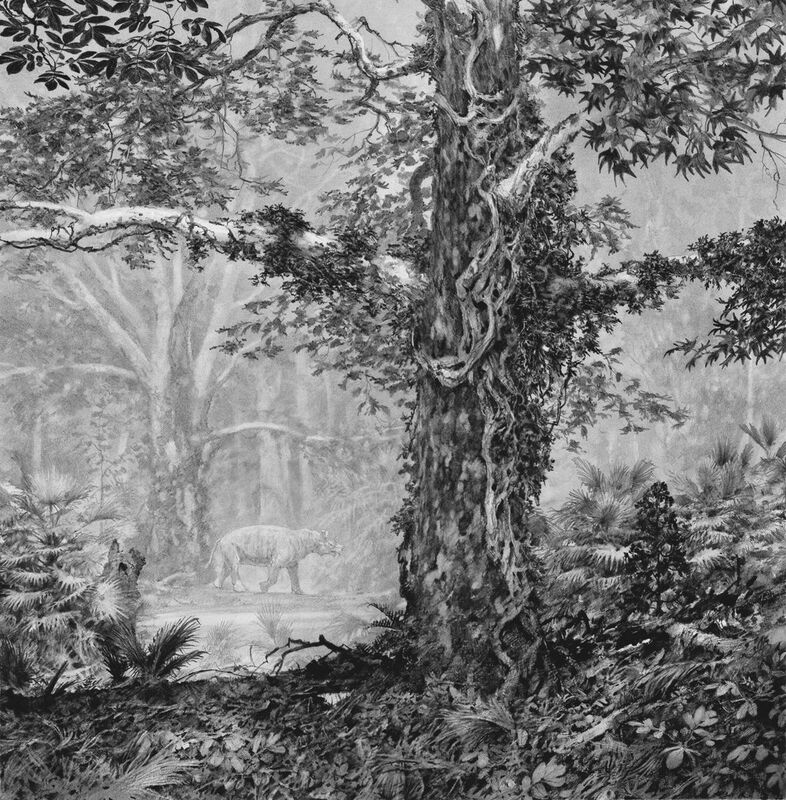 An early Eocene mammal, a Uinatherium, strides through a forest of hickory, palms and sycamore in Utah, some 10 million years after the great impact event that ended the Cretaceous. 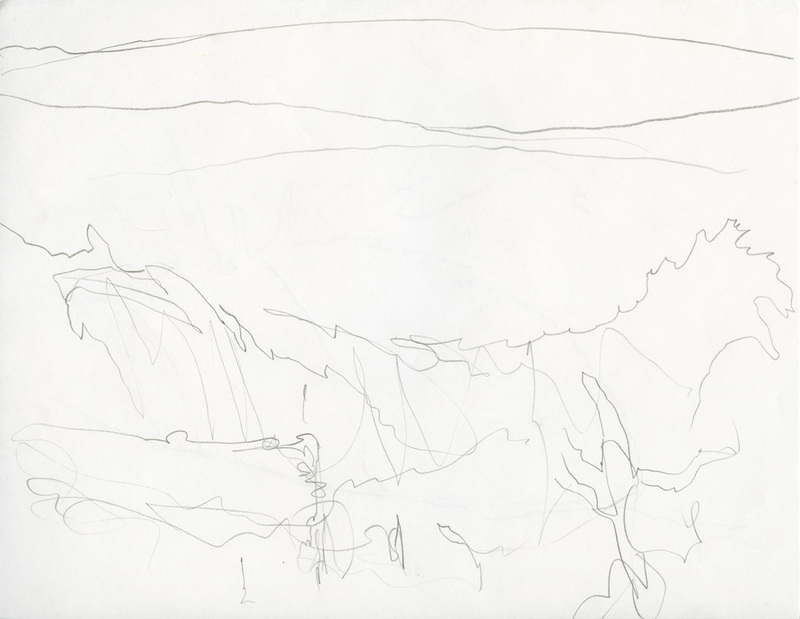 Pencil on 3-ply bristol, detail from 16.25 x 25 inch original work, 2010. Commissioned by the Natural History Museum of Utah. 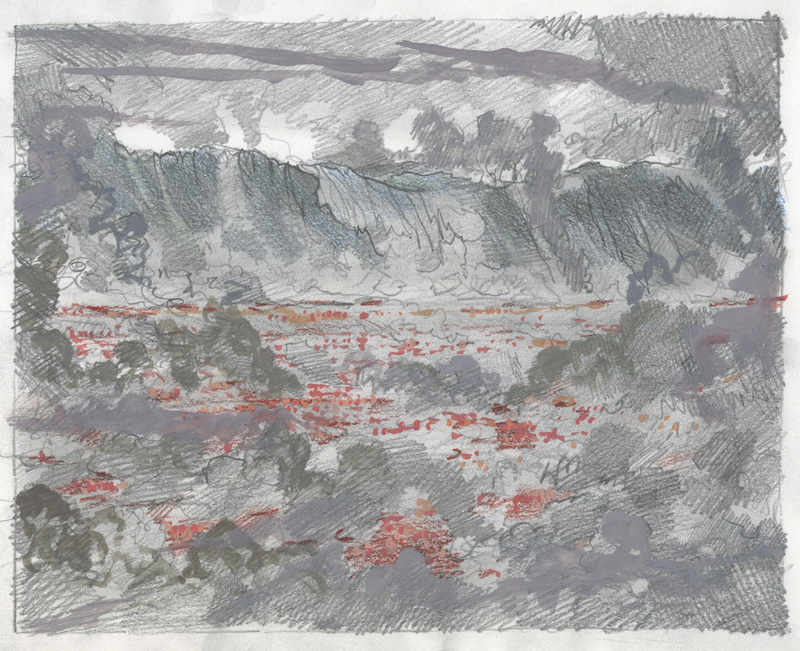 A collection of sketches, design images and finished works that set the stage for a you-are-there representation of the late Cretaceous asteroid impact and a following cascade of impact effects.